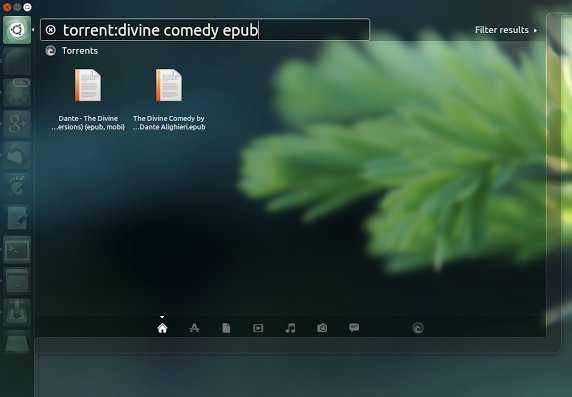 Ubuntu received a lot of flak for their high-handedness when they haphazardly added Amazon search results to Unity dash without taking enough feedback from end-users. The fix-ubuntu debacle didn't help either. But with their decision to include torrent search results into Unity, Canonical is undertaking some much needed damage-control exercises. TorrentFreak is reporting that, Canonical is planning to include torrent search capability to upcoming versions of Ubuntu. The tool's creator has informed TorrentFreak that, while there is still a lot of work to be done, the aim of the scope is to embed Free Culture directly into the Ubuntu user experience. In early December 2013, developer David Callé revealed that a new torrent scope for Ubuntu was now available. Though he was quite skeptical about having the scope included in Ubuntu by default since it would inevitably turn up unlicensed content. But the wholesome embracing of the project by Canonical's founder Mark Shuttleworth himself laid all apprehensions to rest. "The tool is super-useful and it’s perfectly justified to make it available by default. We use torrents for distributing Ubuntu itself. So please don’t hold back!﻿" Shuttleworth replied to Callé. The main motivation behind the torrents scope was to embed Free Culture into the user experience, in the search engine of the OS. The current prototype uses a TPB [The Pirate Bay] backend and is in a very early state in terms of filtering what is presented to the user and how it does it, the developed added. The filtering will be switchable so that users are able to get the full BitTorrent search experience if they so desire. So will this torrent search scope will find its way into Ubuntu 14.04? We'll soon find out. Full interview with developer David Callé can be found at TorrentFreak.